Flambeau Inc., specializes in injection and blow molding and is a worldwide industry leader in thermoplastic manufacturing. Founded in 1947, Flambeau cases are affordable yet effective and are perfect for almost any type of product or industry. Their low cost prices make them attractive cases for sales kits and durable product items. The majority of Flambeau Cases are great for hobbyists’, mild stress job sites, and inexpensive parts. There is no reason to put a $50 part in a $100 case so Flambeau cases are the perfect solution. With a large variety to choose from you have the option of injection molded cases and blow molded cases, all of which are made to last. Although Flambeau Cases are not waterproof or indestructible, they offer a few unique characteristics of their own. These cases are chemical resistant and the case material will withstand years in varying weather conditions. Ameripack is an authorized distributor for Flambeau cases and can easily customize these parts to meet your requirements. The Flambeau blow molded cases come in several different series to meet your demands. The infinity series of cases offer double wall construction for impact resistance and a high quality cam latch for most of their sizes. The Mailer series is intended as a more durable shipping solution than a corrugated box for multiple trips to the post office. The P-Series offers pin hinge construction, heavy duty latches, and a double wall lid for extra strength. The Beta Series offers a molded in handle with durable, double wall construction while the Expandable Tube Series offers an excellent means of protecting your valuable trade show materials. 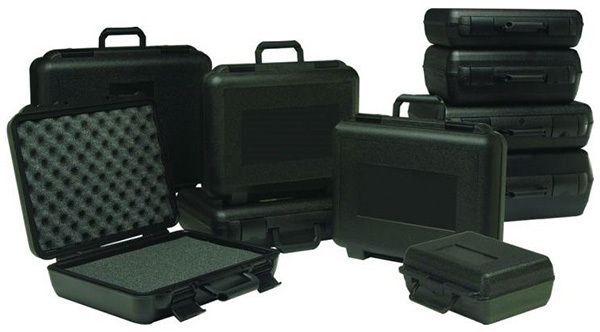 Flambeau also offers a conductive series for your sensitive electronic equipment, the Defender Series ultra high strength blow molded cases and a new series of blow molded rifle cases that are sure to please with their combination of high strength and low weight. Flambeau Products also offers an extensive collection of injection molded cases that are sure to please. Both their Merchant X and Tradesman series of carrying cases are an excellent, lightweight option for many sales kits and feature an innovative, easy to use latching system. The Black Ribbon Series of cases come in a small size but pack a big punch! These cases are high in strength but low in cost and are sold with a clear lid if you need to see your contents while the case is closed. The Secure Lock series will keep your valuables safe and secure.